White: "[Kimbo's] Dead Set About Winning This Thing"
With the ninth season of their hit reality show, “The Ultimate Fighter,” officially in the books, UFC president Dana White is now focusing on the show’s upcoming season where he claims that Kevin “Kimbo Slice” Ferguson is in it to win it. “I don’t think there’s anybody I’ve talked more smack about than this guy,” White said of the street fighting sensation while he was a guest on the Carmichael Dave show. “I said the only way this guy ever gets in to the UFC is through ‘The Ultimate Fighter’ and here he is, I gotta respect that. Kimbo might have his game face on because he knows this is his last chance to cash in his winning lotto ticket. 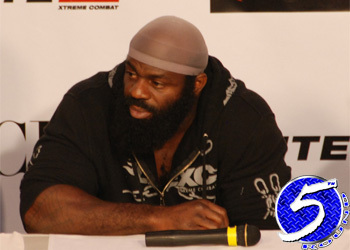 After the fiasco that was his EliteXC career, Kimbo knows that he needs to start from the bottom floor if he’s gonna make this MMA thing work. Here’s the kicker – entry level for the world’s largest MMA promotion has him earning NOTHING. White claims that Kimbo is so intent on winning the heavyweight tournament that the YouTube star turned a deaf ear to all the junk White was talking about him before he opted to call the Octagon his office. Kimbo’s drawing power just goes to show you how much potential the unproved backyard brawler possesses. In actuality, Kimbo doesn’t even have to win the six-figure contract to ensure his future with the UFC. He just needs to make sure that his hard work inside the gym matches his hype.